UNITED NATIONS, Jul 24 2018 (IPS) - Significantly more investment is needed to lift hundreds of millions rural poor out of poverty and make agriculture environmentally sustainable, according to Rob Vos, director of the markets, trade and institutions division at the International Food Policy Research Institute (IFPRI). “The world has over-invested in low-nutrition staple crops, driving up the relative price of nutrition rich-foods. Empty calories is the food system of the poor." -- John Coonrod, executive vice-president, the Hunger Project. While the world population will reach over eight billion people in 2025, the amount of cultivable land will remain the same. Decimated by pesticides, non-sustainable agricultural techniques, and water waste, healthy nutrients will become harder to access for the growing population. This issue, along with food waste (20 percent of every food purchase is wasted), is a major concern for Verburg, who highlighted the need to rethink food systems and stop blaming agriculture. The relationship between the private sector and agriculture isn’t new. On the contrary, many farmers-especially the poorest ones-are members of the private sector. 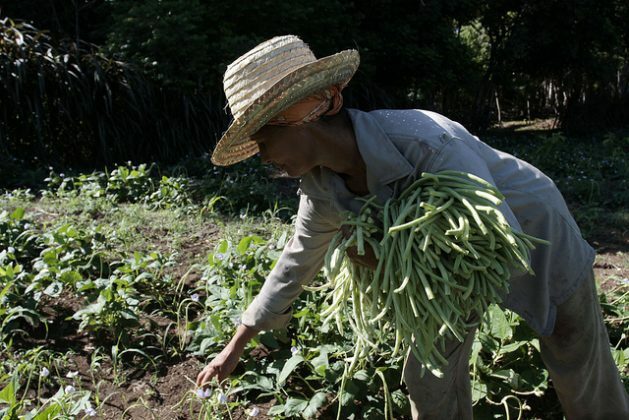 “The majority of poor and hungry people are small-scale farmers. They are in fact members of the private sector, albeit the weakest. And some corporate investments in agriculture can hurt them,” John Coonrod, executive vice-president at the Hunger Project, told IPS. The weakness of poor farmers and the growth of low-nutrition crops have been, until now, some of the deterrents of efficient agriculture. “The world has over-invested in low-nutrition staple crops, driving up the relative price of nutrition rich-foods. Empty calories is the food system of the poor. To overcome malnutrition, we need to increase the dietary diversity of the poor to include many more fruits and vegetables, which means increasing their local production and reducing their price to local consumers,” Coonrod explained. “This will help provide better and more stable market conditions for farmers, create lots of new jobs, and limit the risks of investing in agriculture itself,” he said. Brian Bogart, senior regional programme advisor for South Africa to the U.N. World Food Programme, agreed with Vos. “Key areas for investment to equity in food systems include rural infrastructure, access to markets, knowledge and technology, and improved storage and transport capacity to reduce post-harvest losses,” Bogart said. During the event, Verburg, from SUN, pointed out the importance of political commitment and leadership within countries to reduce hunger and reshape food systems. “With shrinking public investment in agriculture (according to the Secretary General’s progress report on the SDGs, government expenditure as a percentage of GDP declined from .38 to .23 between 2001 and 2016 and international aid allocations for agriculture declined by 20 percent between the mid-1980s and 2016), the question is how public-private partnerships can unlock opportunities for private investment to complement public resources and capacity to generate improved food security, particularly for the most vulnerable populations,” he added. Some countries are already doing this. The Barilla Centre for Food and Nutrition’s Food Sustainability Index on sustainable agriculture; nutritional challenges; and food loss and waste which ranks 34 countries according to eight categories, which are in turn divided among 35 indicators, reveals that France, Japan, Germany score highest. Finally, Vos highlighted the importance of research in reducing hunger.